This investigation is an outgrowth of my doctoral dissertation at Princeton University. I am particularly grateful to Professors George F. Pinder and William G. Gray of Princeton for their advice during both my research and my writing. 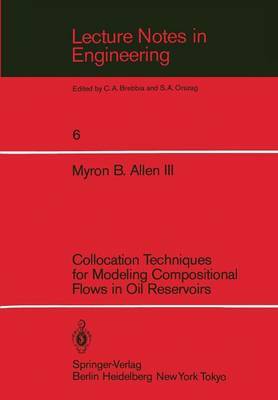 I believe that finite-element collocation holds promise as a numer- ical scheme for modeling complicated flows in porous media. However, there seems to be a "conventional wisdom" maintaining that collocation is hopelessly beset by oscillations and is, in some way, fundamentally inappropriate for multiphase flows. I hope to dispel these objections, realizing that others will remain for further work. The U. S. National Science Foundation funded much of this study through grant number NSF-CEE-8111240. TABLE OF CONTENTS ABSTRACT ;; FOREWORD ;; ; CHAPTER ONE. THE PHYSICAL SYSTEM. 1.1 Introduction. 1 1.2 The reservoir and its contents. 5 1.3 Reservoir mechanics. 9 1.4 Supplementary constraints. 18 1.5 Governing equations. 26 CHAPTER TWO. REPRESENTING FLUID-PHASE BEHAVIOR. 39 2.1 Thermodynamics of the fluid system. 40 2.2 Standard equation-of-state methods. 45 2.3 Maxwell-set interpolation.